Much of the plan for San Francisco’s Treasure Island, a 403-acre man-made former military base below the Bay Bridge, is already laid out. However, what if the progressive idea of the beta community; future residents and tenants visioning their own neighborhood into reality in partnership with developers and investors, was in full motion today? 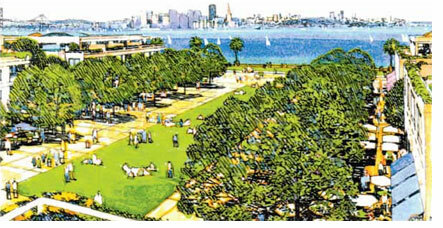 We’d perhaps get the proposal for Treasure Island similar to that of urban design students at UC Berkeley’s College of Environmental Design – 20,000 people in a truly walkable, urban environment, car-free, entertainment and recreation rich, with an ecological infrastructure. More details here. A contemporary mini-Venice. There’s no doubt that the market is there (half the population of Manhattan doesn’t even have a driver’s license, even less around the world) – it’s just a matter of time. Of course, this is an amazing idea. Sometimes I believe that if all such innovative and beautiful plans that I see in sketches everywhere actually became reality, our cities would all be remarkable places.